InvestorCentric: How Long Will Labor Markets Continue To Struggle? 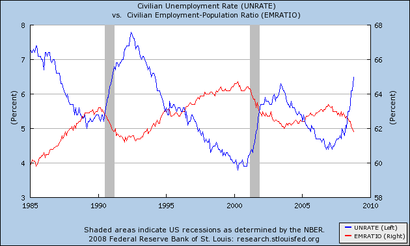 How Long Will Labor Markets Continue To Struggle? The biggest worry most people have during a recession is that they may lose their job. With major layoff announcements happening daily now, the labor market is certainly struggling. 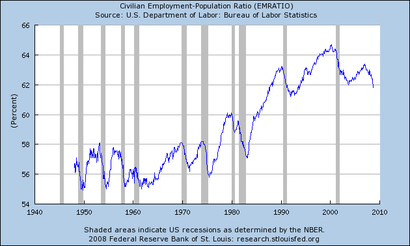 But how long will labor markets continue to struggle? Economics professor Mark Thoma looks closer at this dynamic, and offers valuable insight, in his blog post from Economist's View. This means that once the trough of the recession in output growth is reached - and we are not there yet - then there will be a considerable period of time before the labor market recovers if this downturn is like the last two. How long of a time period? 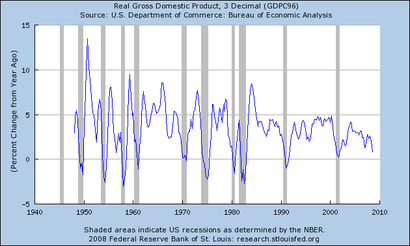 Focusing on the last two downturns, the trough of the 1990-91 recession was in March 1991. 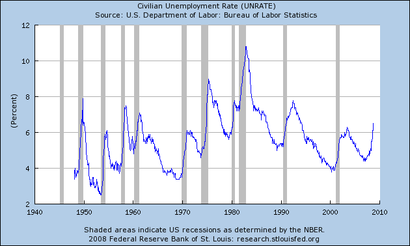 However, the peak unemployment rate wasn't until June, 1992, 15 months later. The employment to population trough was a bit earlier, December, 1991, but it was still 9 months later (and there is a second, slightly higher trough a few months later - see the red line in the second graph above). Thus, once the recession has officially ended, the average number of months until unemployment peaks is 17.5, and the average time until the employment to population ratio troughs is 15.5 months. So, if the past two recessions are a reliable guide, expect around five quarters or so of additional labor market problems even after output growth turns around. Is the past a reliable guide? I wish I could answer, but as far as I know the exact reason for the increased time until the labor market recovers observed in the last two recessions is unknown (there has always been some delay, but lately it has increased considerably). One reason could be that labor hoarding has increased due to higher training costs or some other reason. With firms retaining more labor through the downturn and hence more excess capacity than in the past, they can expand output once the recovery starts for a longer period of time without increasing the labor force, or at least not increasing it by much. With employment growing slower than population, and also growing slower than the number of people looking for jobs, the measures above would increase for awhile even after the economy turns around. If firms also install labor saving equipment at a greater rate than in the past as the recovery begins, or if the equipment is installed at the same rate but it is even less labor intensive than in the past, the growth in employment could be even slower. But as I said, even though there has been lots of research into this question, the exact reason for the change in labor market behavior is not known with certainty. This article has been reposted from Economist's View. The full post can also be viewed on Economist's View.